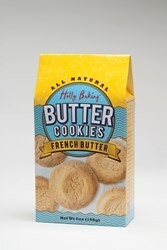 Moon Dance Baking’s French Butter Cookie has been named a Finalist for Outstanding Cookie in the 2013 sofi™ Awards from the Specialty Food Association. A sofi™ Award is the top honor in the $86 billion specialty food industry; “sofi™” stands for specialty outstanding food innovation. This year’s finalists were selected by a national panel of specialty food professionals from a record number 2,573 entries across all 32 awards categories. Winners were announced at the Summer Fancy Food Show in New York City. “We are thrilled that our new French Butter Cookies made it to the finals,” says Debby Dyar, President of Moon Dance Baking. “We worked hard to perfect this recipe, and I think the butter really shines through. Our customers tell us this is their new favorite, and we are delighted the judges liked it too,” says Dyar. The sofi™ Awards are open to members of the Specialty Food Association, a not-for-profit trade association established in 1952 for food artisans, importers and entrepreneurs with more than 3,000 members in the U.S. and abroad. For more information on the association and its Fancy Food Shows, go to http://www.specialtyfood.com. Learn more about the 2013 sofi™ Awards at specialtyfood.com/sofi. “Specialty food makers bring craft, care and joy to the foods they create. To be honored with a sofi™ Award nomination means the product truly stands out above the rest,” says Specialty Food Association President Ann Daw. Moon Dance Baking, Inc. offers a variety of classic Biscotti, Cookies and Licorice. Our products are all-natural and are manufactured in Sonoma County wine country. We have award winning Biscotti, Nuggets, scrumptious Butter & Chocolate Chip Cookies and delicious Cookie Brittle. Our Licorice is a confectionery classic and gluten free. For more information, contact Debby Dyar at 707.588.0800.